Jerry Barrett (1824-1906), Painter. Artist associated with 9 portraits, Sitter in 4 portraits. George Barratt. Sitter in 1 portrait. John Breese (1817-1889). Sitter in 1 portrait. Charlotte Canning (née Stuart), Countess Canning (1817-1861), Wife of 1st Earl Canning. Sitter in 3 portraits. George Russell Dartnell (1799-1878), Army surgeon. Sitter in 1 portrait. Colonel Eden. Sitter in 1 portrait. Mrs Eden. Sitter in 1 portrait. Sir Charles Grey (1804-1870), General, private secretary to Prince Albert of Saxe-Coburg-Gotha and private secretary to Queen Victoria. Sitter in 4 portraits. James Higgins. Sitter in 1 portrait. Hon. Lucy Maria Kerr (1815-1874), Maid of Honour to Queen Victoria. Sitter in 1 portrait. Sergeant Leny. Sitter in 1 portrait. John McCabe. Sitter in 1 portrait. Sir Charles Beaumont Phipps (1801-1866), Court official. Sitter in 4 portraits. Queen Victoria was deeply affected by the sufferings of her troops in the Crimea. 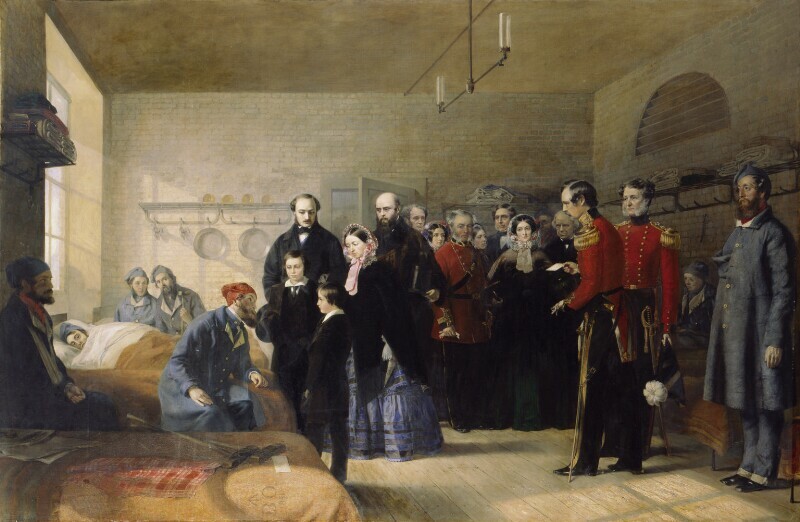 Barrett shows her visiting disabled soldiers at the Brompton Hospital, Chatham on 3 March 1855, with her husband, Prince Albert, and their two eldest sons, the Prince of Wales and Prince Alfred, later Duke of Edinburgh. The bearded figure behind the Queen is her cousin George, Duke of Cambridge, who had himself fought at the battles of Alma and Inkerman but who returned home in horror at his experiences. At the right of the official party behind the royal group is Lord Hardinge, Commander-in-Chief of forces. The two uniformed officers in front of him are Colonel Eden, Commandant of the Chatham garrison, and, holding a card, Dr. Reade, staff surgeon of the hospital. A number of the disabled soldiers can be identified. Seated on the bed talking to the Princes is Sergeant Leny, who had fought at the battles of the Alma, Balaclava, and Inkerman, while the figure lying in bed behind him is the badly injured James Higgins, whose 'appearance caused much painful emotion to her Majesty'. Seated on the far left is Private John McCabe who sustained terrible injuries taking part in the cavalry charge at Balaclava. The standing figure on the far right is Sergeant John Breese who lost an arm at Inkerman: after the Queen's visit he was appointed to her personal Body Guard. Behind him sits the sad figure of George Barrett who received a shot between his eyes at Inkerman, leaving him with a 'fearful scar' and the loss of his senses of taste and smell.